At Action Kung Fu, we are continually making improvements to our classes by adding new and exciting programs for you and your family. Occasionally, we make changes to the Schedule based on the time of the year and making room for new classes for you to participate in. Make sure to check back here often to see what we have to offer and download the most recent schedule available. Our Schedule is produced in Adobe Acrobat. Make sure you have Adobe Acrobat Reader installed to view it. The Kung Fu style of Southern Praying Mantis is rooted in tradition. The techniques used are based on contacting the opponent, controlling them and then attacking. The beginner student will focus on developing the essential skills of root and endurance. Advanced training involves many 2 man exercises as well as conditioning and strength training. "Shaolin Kempo Karate" was founded by Grandmaster Frederick J. Villari. In the last three decades, his fighting system has become widely recognized and respected. His art traces its origin back over a thousand years to the Shaolin Temple of China. Many of the basic methods are still used in his schools today. The present form has become famous because of its very effective "Four Ways of Fighting." After studying and mastering many different styles and ways of fighting, Grandmaster Villari concluded that there really were only four ways of fighting. Felling - that is to knock an opponent off his feet by throwing, tripping, pulling, pushing, shoving, or scooping him. Grappling - by either wrestling, holding, breaking, and locking bones or joints against nerve centers. The Little Ninjas Program is a detailed curriculum that focuses on improving pre-school age children's basic motor and listening skills. These skills will help them develop with a more confident and enthusiastic outlook. They will become better students at school, better listeners at home and more ambitious towards the future. We believe the time between the ages of 3 and 6 are the most important years of a child's development. Our program will enhance positive development in a fun and motivating way. The Little Ninjas program will also prepare your child for the Junior Tae Kwon Do class. The skills they are taught are composed of physical and mental benefits. The following are the skills with the benefits from participating in the Little Ninja class. "Little Ninjas today, leaders tomorrow"
The Lion Dance is the most popular cultural performance in China. The performers are usually members of a Kung Fu school, and when performed correctly the dance can bring good fortune and prosperity to wherever the dance is performed. While most often seen during the celebration of the Chinese New Year, it can be performed anytime, anywhere, and can be used to celebrate anything from a restaurant opening to a birthday. In Chinese culture the lion is seen as a lucky animal, even though it is not native to the region. During the time of the Han Dynasty (205 BC - 220 AD), Rulers wishing to trade along the famous Silk Road sent the Emperor a gift of a lion. Therefore when a lion arrived, it meant that trade, and thus prosperity, was coming. During the reign of the Manchu's, however, the practice of the martial arts was outlawed. This forced the masters of the times to come up with a way to continue to practice their arts without being caught, and thus Lion Dance was born. If you look closely at a Lion Dance, you will notice the moves are the same as that performed by a Kung Fu practitioner. Therein lies the secret of the Lion Dance. It is not just a beautiful cultural performance, but a practice of the deadliest martial arts known to man. All Lion Dance movements have applications to Kung Fu, and can teach the students footwork, stances, coordination and also enhances ones strength and endurance. Each Lion is controlled by two performers - one inside the head, the other in the tail (or body). No performance is complete however without music, and thus three instruments; - a drum, a cymbal, and a gong accompany the lions, providing a backbeat for the Lion to move with. Quite often, a Buddha will accompany the Lions. The practitioner under the head is the one who sets the Lions performance. This can range from simply standing still and looking around to standing on the shoulders of the other practitioner, making the Lion appear to be rearing up. It can take many years of training to reach this level of performance. At one point during the performance the Lion will inevitably come across the Choy Chang, also known as greens, which is usually a lettuce attached to a Hong Bau (Lucky Red Packet). The Lion will make a show of approaching the greens, maybe backing off a few times, and will eventually eat the Choy Chang, taking the Hong Bau and spitting the greens at the audience. Being hit by the greens is very lucky. 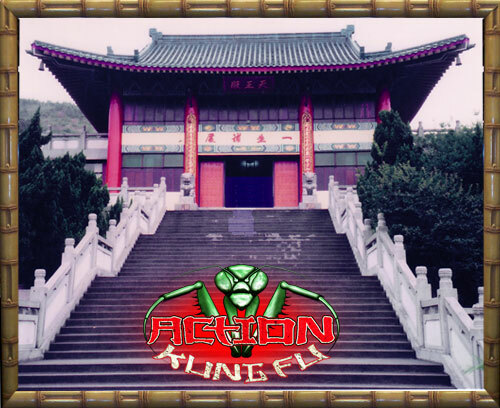 Here at Action Kung Fu we teach and believe that every true Kung Fu martial artist should know the Lion Dance, for it will bring to the student stronger stances, better balance, footwork, agility, stamina, coordination, and better structure. Kick and punch your way to the BEST workout you will ever experience! A workout that combines aerobics, cardiovascular and body toning with basic self-defense tactics- all set to some great music! Reduce stress and burn fat while improving strength, muscle tone, endurance and self-confidence. Cardio-Kung fu is ENERGIZING, EXPLOSIVE and UPLIFTING… Come and see what everyone is talking about!! No martial arts, boxing or kick-boxing experience necessary. We welcome ALL fitness levels. Refrain from eating at the wrong times. Kung Fu weaponry has a history as ancient as the various styles themselves. The use and development of weapons in Kung Fu varied with the time and place in which each weapon originated and flourished. The Northern Chinese provinces used different weapons to those practitioners in the South. Although all weapons were originally designed for combative purposes, over the years weaponry usage has been utilized for the development of; strength in the arms and wrists, eye-hand coordination and the promotion of timing and control. Kung Fu weaponry originally composed of 18 classical weapons. 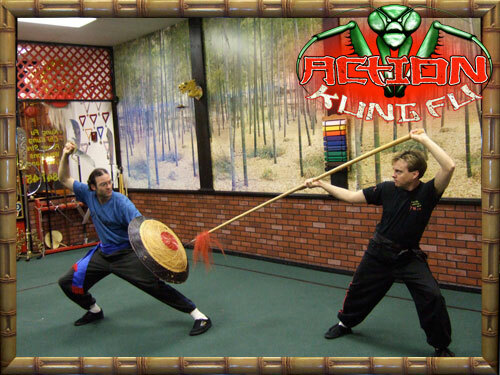 Here at Action Kung Fu we teach the Basic 5 weapons, Staff, Spear, Broadsword, Double-edge sword, and any Chinese weapon of your choice. Shuai Chiao is commonly translated as Chinese wrestling. It is a special fighting system which teaches practitioners how to set up a trip and throw an opponent down. Also considered a sport, Shuai Chiao can be used for purposes of either performance or competition and is governed by a set of rules to determine what constitutes a well-executed performance or a win. According to Shuai Chiao rules, punching, kicking and locking skills are not permitted, and if any part of the body other than a competitor’s feet touch the ground, that competitor loses the match. In Chinese, Shuai means “to throw down,” and Chiao refers to a “stumble or fall caused by a trip.” Shuai Chiao research is focused only on the skills needed to trip an opponent and throw him to the ground. Ground techniques are not researched because if you find yourself in a position to need them, you have already lost. There is nothing you can do to win from a position on the ground given the Shuai Chiao rule that your feet are the only part of your body that can touch the floor. Shuai Chiao practice focuses on the throwing skills in great detail, and for this reason, its throwing skills differ greatly from those used in Judo and in western-style wrestling. Strictly speaking, the common translation of Shuai Chiao as “wrestling” is not accurate since no true wrestling skills are involved in Shuai Chiao practice. A more accurate translation would be simply “throwing”. Whether Shuai Chiao is used for performances, competition or fighting, there is only one training system and one set of skills. These skills, however, are applied differently depending on the situation, and different sets of rules apply to performance and competition. As for Shuai Chiao fighting, all rules are ignored. Yang Style Tai Chi Chuan is one of the gems in the realm of Chinese martial arts. Ever since the founder of Yang Style Tai Chi Chuan, Yang Lu Chan, his sons Yang Ban Hou and Yang Jian Hou, his grandsons Yang Shao Hou and Yang Cheng Fu, and his great-grandsons Yang Zhen Ming, Yang Zhen Ji, Yang Zhen Duo, and Yang Zhen Guo have all worked together to research, change, develop, and spread Tai Chi Chuan. Yang Style Tai Chi Chuan has become extended and graceful, carefully structured, relaxed, gentle and flowing, while still maintaining the martial arts aspects. It is also a method for improving health and curing illness. Tai Chi Chuan is loved by tens of millions of practitioners, spreading Tai Chi Chuan at home and abroad. It has become the most popular of all Chinese martial arts, providing a remarkable contribution to the health of mankind. This program includes Chi Kung Breath Control, Internal Work, External Work, Breathing, Exercise, and Therapy. These exercises of Chi Kung will awaken and circulate healing vital energy through the (acupuncture) meridians of the body. The primary circulation is known as the “small heavenly cycle” or microcosmic orbit and is felt as a warm current circulating up the back and down the front of the face and torso. This primary circulation is the ancient foundation of oriental spiritual healing and martial arts. The practicing of yogic arts will certainly end in failure when one comes to old age without the studying of a breathing system. This Chi Kung program will teach beginners and experienced, Chi Kung Internal work A-Z, while offering information and exercises that are not available in most schools in the USA. The core of our program is the ability to control the breath of life and its effect on physical and mental health and use in cultivating vital energy (chi). Breath control leads to higher mental process and awareness states. These Chi Kung methods will cultivate a state of energized health and longevity. Power Strength is a program composed of 4 levels. The levels are Basic, Intermediate, Advanced and Highly Advanced. Each level is a series of exercises for development of a student’s power and strength. They consist of internal and external exercises as well as isotonic and isometric exercises. The Power Strength Program will build great stamina and harden the body in a matter of weeks giving the student enormous gains in physical strength and muscular size with no weights what so ever. It applies to ones self-defense ability by hardening the body to resist punches and kicks to prevent injury. Site best viewed at 1024 x 768 screen resolution or higher.